Standing proudly erect at an altitude of 6654m, Mera Peak is the most popular trekking destination and is the highest trekking peak in Nepal . This fairly challenging trek has been designed to cater to trekkers' adventure needs to explore Mera peak from length to breadth. 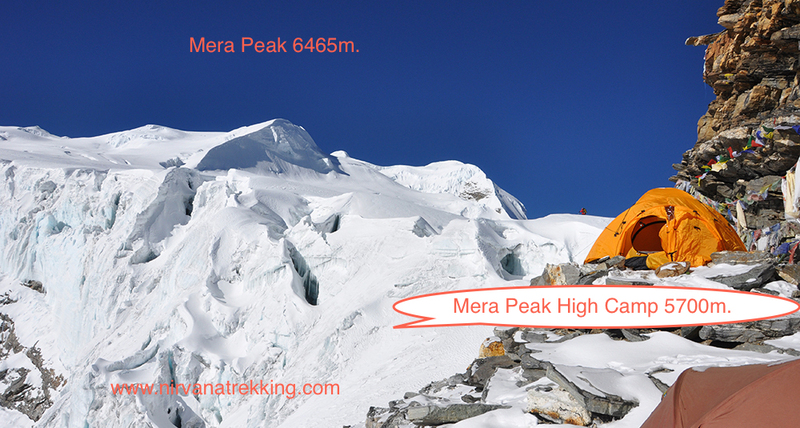 On scaling the summit of Mera Peak , we can have the most spectacular view of entire Himalayan ranges.
. 3 nights' accommodation at 3 star hotel in Kathmandu on double room sharing with breakfast.
. All guided sightseeing tour in Kathmandu and entry fees.
. Lunch & dinner in Kathmandu .
. Personal climbing gears & clothing, (available on hire).
. Tips, any expenses of personal nature, client's insurance.